Note of August 14, 2015: See the comment section where a reader has forwarded information on the Perkins Hotel and several of the people mentioned in the letter; he found that there were people of that name living at Lyme, New Hampshire, which also had a Perkins Hotel. 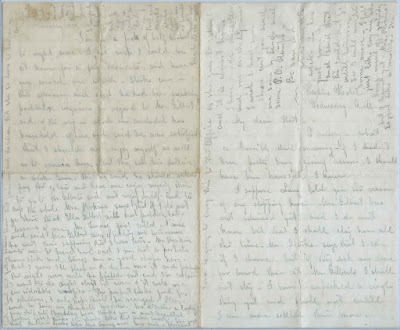 Circa 1860 letter to "Hat" from "P. M.", presumably a woman, away from home teaching piano. One sheet, folded into four panes, with every inch covered in handwriting, margins and top included. 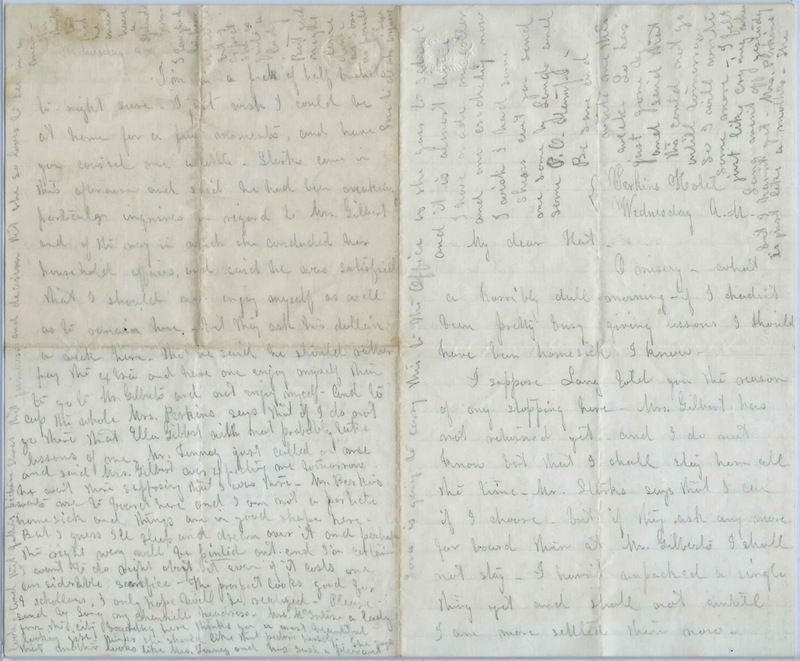 Thanks to a reader who found that the Perkins Hotel was likely the one at Lyme, New Hampshire, and considering the age of Emma Perkins, then age ten, it appears that the letter was written about 1860 or 1861. P. M.'s comments about the quality of the piano at the Perkins Hotel and the "scraping" and "screeching" of two visiting violinists are especially amusing. Sadly, there's no accompanying envelope, and no place names were included, though I believe that it might have been a rural place, perhaps a vacation spot. She wrote the letter from Perkins Hotel, but that might have meant a boarding house or even a private home that took her in, at first temporarily, but perhaps permanently. See images of the panes and a transcription at the end of this post. If you have a theory as to the letter writer's identity or corrections and/or additions to the transcript, please leave a comment or contact me directly. Lang - someone apparently known to both Hat and P. M.
Mrs. Perkins - P. M. is temporarily boarding with her at $2 a week and is thinking about staying there permanently, rather than at the home of Mrs. Gilbert, with whom she had initially intended to board; Mrs. Perkins may be also be P.M.'s piano student. Mrs. Perkins was presumably of the Perkins family who operated the Perkins Hotel at Lyme, New Hampshire. Mrs. Pushee - there was a Pushee family living at Lyme, New Hampshire. Briggs - he was one of six gentleman callers, two of whom were the Pushee violinists. Lue or Sue - but the word might be "Love", as in a closing greeting. O misery - what a horribly dull morning - if I hadn't been pretty busy giving lessons I should have been homesick, I know. [Written along left edge and top of Pane 2 - continued from left edge and top of Pane 1]: made me go down twice and __ [?] me. And last night tried all she could to have me take something for my headache, but I knew that all I needed was sleep. I am well enough today. in. Two of them were Pushees and had violins. They commenced playing soon after they got in - and such a scraping and screeching I never heard before - One fellow named Briggs attempted to be quite agreeable to me but I was not disposed to be very communicative and took the earliest opportunity to plead as an excuse for leaving a severe headache and retired. They stayed and played till after ten of the clock - It sounded beautifully up in my room after they began to sing and play the Piano with the accompaniment of violins. Clary Pushee and Mrs. Perkins sang. Clary is a beautiful alto singer. Mrs. Perkins is not much. look and that father's picture shows that firmness and decision that she so loves to see in a man. She thinks too that he must have a splendid form. I laughed to hear __ [?] but I expect she is quite a lady. But good night . Come down as soon as possible. Love to all who inquire. Again, if you have a theory as to the identity of any of the people mentioned in this letter, or if you have corrections and/or additions in the transcription, please leave a comment or contact me directly. Thanks! I believe that the Perkins Hotel was in Lyme, New Hampshire. There is a photograph here. Living in Lyme in 1880 were a Francis Pushee and his sister Clara (Francis, a.k.a. Frank, was a violinist). There also was an Emma Perkins living in town, and an Ella Gilbert grew up there. Other surnames from the letter appear in Lyme as well.